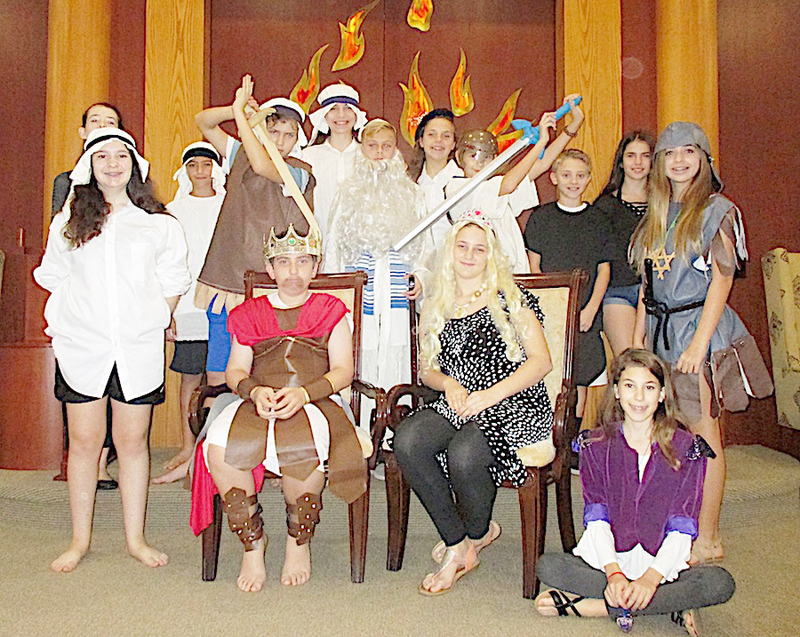 Seventh grade students of the Temple Emanu-El Religious School pose after performing in a Hanukkah play. For Janet and Steve Hiller, Hanukkah has always been a time of celebration and tradition. Jews have observed Hanukkah for more than 2,000 years in recognition of the Maccabees defeating the Syrian-Greek King Antiochus. “Antiochus demanded the Jewish community stop practicing their faith,” said Elaine Rose Glickman, whose husband, Rabbi Brenner Glickman, leads the Temple Emanu-El congregation in Sarasota. Elaine Rose Glickman also is a trained rabbi. When they finally retook the Holy Temple in Jerusalem and went in to rededicate the temple they found the king’s men destroyed all of the oil for the lamps, except for one vial, enough for one night. Miraculously the one-day supply of lamp oil burned for eight days. Janet and Steve Hiller sit in the kitchen of their River’s Reach home in Parrish with some of the traditional foods eaten during Hanukkah celebrations. 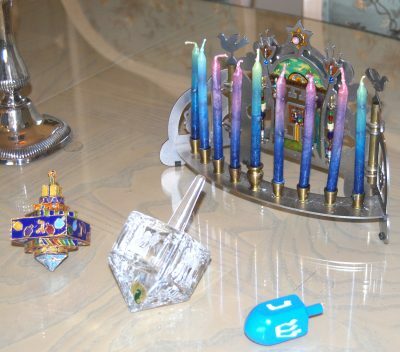 In celebration of the miracle of the oil, Jewish families began Dec. 24, the first day of Hanukkah this year, by lighting a candle on the menorah, a special candelabra with nine places for candles, saying a special blessing. Each of the next seven evenings an additional candle was lit until the last evening when all are lit. “We continue to celebrate, even though our children are grown and have left the home,” said Steve Hiller, who retired earlier this year from a medical practice on Long Island in New York. He and his wife Janet, who also retired as a foreign language professor at a Long Island university, moved in August to River’s Reach in Parrish. When the three Hiller children lived at home, Hanukkah, or the Festival of Lights, as it is sometimes called, was celebrated with the lighting of the menorah, traditional foods, games, songs and gift giving. 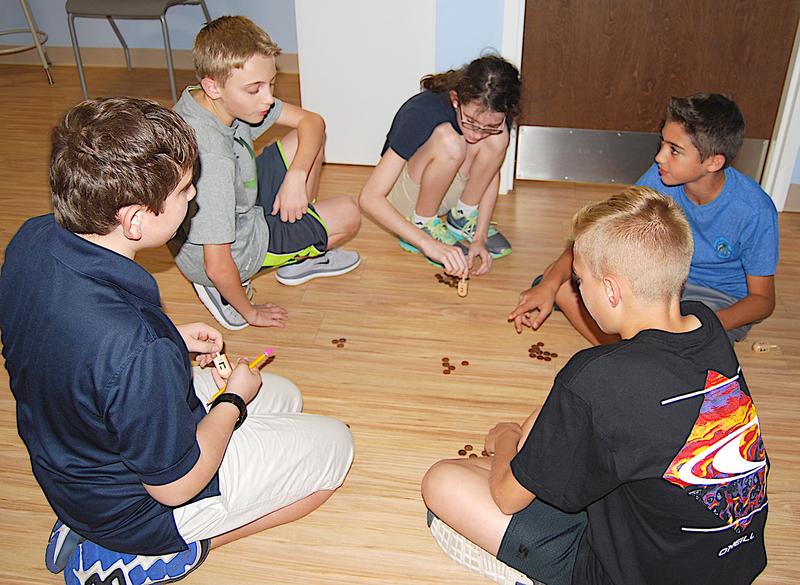 The Hillers remembered how their children would play the traditional Hanukkah dreidel game. 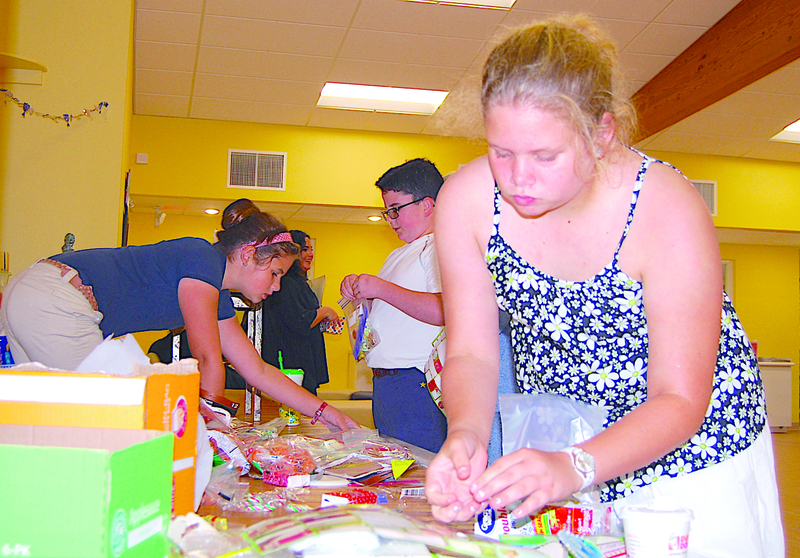 Alexandra Witherspoon, 10, left, Garet Pearson, 11, and Madison Witherspoon, 10, help fill bags for the Temple Emanu-El Mitzvah Backpack Program. In Israel, the dreidels refer to “A Great Miracle Happened HERE,” because the Holy Temple was in Jerusalem. As each child would take a spin, depending on which side of the dreidel was showing, the one spinning would place one coin or piece of candy into the “pot,” or take one piece, or half of the “pot,” or none. The family continued to exchange gifts, even though they are spread out from Oregon to New York to Israel to Florida. 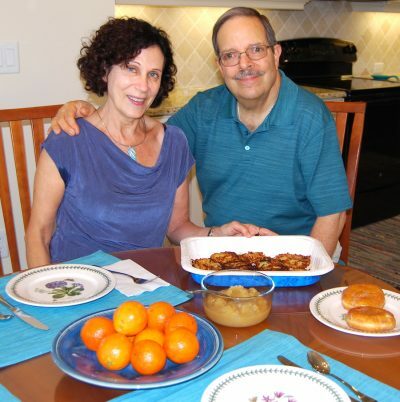 Janet and Steve Hiller also carry on the tradition of having latkes, traditional potato pancakes, fried in oil to commemorate the temple miracle. A menorah sits in the window of the Hiller home. 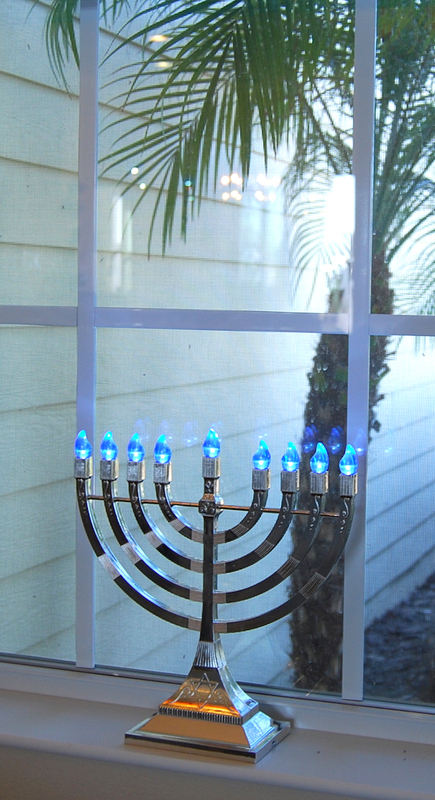 Janet Hiller said it is traditional to place the menorah in a window during Hanukkah. 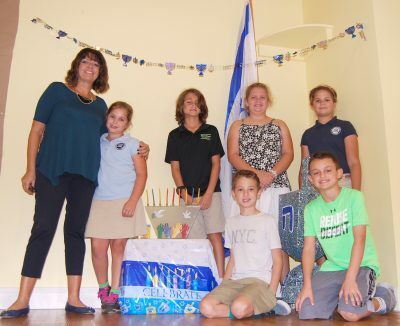 For Sabrina Silverberg, education director of Temple Emanu-El Religious School and a resident of Kingston Estates in Parrish for 13 years, Hanukkah was a great time to educate the broader community about Judaism. We all may not have the same customs, but we do have the same core values, she said. Sabrina Silverberg, education director of Temple Emanu-El Religious School, poses with some of the students, from left, Emma Witherspoon, Nicholas Cuttler, Madison Witherspoon, Alexandra Witherspoon, Hyden Stroud, knelling, left, and Eli Hanan. When Silverberg’s children were in school, she would arrange to present a program on Hanukkah to all the students. As the religious education director at Temple Emanu-El, Silverberg has made sure the children learn another tradition of Hanukkah. During Hanukkah, children would anticipate receiving gifts, but they also learned the importance of giving back to the community. 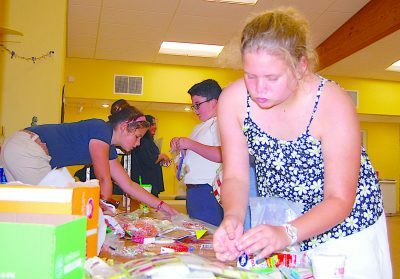 Many of the children in the temple education program participate in the Mitzvah Backpack Program where they assemble bags of food for other children in the community who would otherwise go without eating over the weekend when there are no school lunches. “I feel happy helping other kids who don’t have enough,” said Alexandra Witherspoon, 10, who helped pack the food bags recently. Garet Pearson, 11, said it was important to volunteer with the program. For an entertaining explanation of Hanukkah, a Jewish a cappella group, the Maccabeats, produced a music video based on the popular Broadway musical, Hamilton. A cousin of Janet Hiller helped found the New York-based group. The video can be viewed at youtube.com/watch?v=u3UubcYj49k. For more information about Temple Emanu-El, 151 McIntosh Road, call 941-371-2788, or visit their website at sarasotatemple.org. Menorahs and dreidels come in various sizes and designs. These are some of Janet and Steve Hiller’s favorites they like to display during Hanukkah. Students in the Temple Emanu-El Religious School demonstrate how to play with the dreidel, a traditional Hanukkah children’s game. From left, are David Howard, Seth Gross, Lindsey Soss, Jonah Seldin Schneider, and Noah Chyorny.